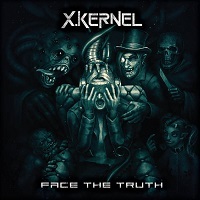 Kiev, Ukraine’s X. KERNEL formed in 2009, as a Melodic Death Metal band. Following the release of an EP in2013, “Face The Truth” is the band’s debut, featuring eleven tracks. The album works off of themes of mental and social diseases, and is divided conceptually between two sub-themes; the first being how fatigue and devastation lead to a loss of your soul, and the second being man’s fight with paranormal forces, and an inability to rest, even after death. “Intro” is a beautiful and powerful introduction to the album, with keys, acoustical and twin electric guitar melodies, leading to “Exhausted.” As a keyboard lover, I welcome the strong combination of keys and guitars that lead the sound on this track. The vocals are deep and strong, and there is a boundless energy to the layers of intelligent songwriting. The drum work is amazing also, varied and stalwartly holding together the rhythm. “Kingdom Of Pain” has a bossy sound, with riffs and keys that branch out at you like the limbs of a gnarled tree brought to life in a forest of the undead. The chord progressions are on point, detailing a sophistication in the sorrowed sound that is really missing in this genre today in many ways. “In The Void” is the first track we hear with some clean vocals. They are hauntingly sorrowful, giving a Gothic edge the song, which lumbers heavily, like the plodding footsteps of an oversized monster bent on destroying all in his path. “Dying Gods” is another track where the keyboards are as responsible for the direction of the sound as much as the vocals and other instruments. I picture Alina playing amidst a cloud of smoke, fire shooting from her fingers as she punishes the ivories with the maddened senses of an evil scientist. “The Last War” has a sparkling guitar intro to a song that is hasty and heavy with an ominous quality. Once again, the keys shine brightly here, and a well-timed guitar solo supports the chaotic riffage. The thematic elements of the album take the form of spoken word in the short track “Interludium,” which segues into “No Fate.” They construct a pleasingly evil sound here, explaining the concept of what it means to not have fate to guide your life, when there is nothingness in its place. “Dream Of Sun” closes the album. If the sun represents warmth, happiness and the provider of all life, the dark elements of this track represent a world without this. What a strong ending to a strong debut. Overall, the ode to the masters of this style is there, with pieces of DARK TRANQUILITY, AMORPHIS and INSOMNIUM, but do not mistake this as a copy/cut-rate version of what has already been done. They are blazing their own trail in the genre, and as a debut full-length, I am quite impressed with the variation, melodic sensibilities, and the commanding might they assume as a group. This is an excellent album, proving that there is still room for bands who are willing to build upon their influences with their own design.